detect sounds and the motion of the body. These last functions are carried out by the inner ear, which is discussed on a separate page. Link to it. The other functions are discussed here. Light touch is detected by receptors in the skin. Many of these are found next to hair follicles so even if the skin is not touched directly, movement of the hair is detected. Touch receptors are not distributed evenly over the body. The fingertips and tongue may have as many as 100 per cm2; the back of the hand fewer than 10 per cm2. This can be demonstrated with the two-point threshold test. With a pair of dividers like those used in mechanical drawing, determine (in a blindfolded subject) the minimum separation of the points that produces two separate touch sensations. The ability to discriminate the two points is far better on the fingertips than on, say, the small of the back. The density of touch receptors is also reflected in the amount of somatosensory cortex in the brain assigned to that region of the body. Link to illustrated discussion of the somatosensory cortex of the human brain. Proprioception is our "body sense". It enables us to unconsciously monitor the position of our body. It depends on receptors in the muscles, tendons, and joints. If you have ever tried to walk after one of your legs has "gone to sleep", you will have some appreciation of how difficult coordinated muscular activity would be without proprioception. Pacinian corpuscles are pressure receptors. They are located in the skin and also in various internal organs. Each is connected to a sensory neuron. Because of its relatively large size, a single Pacinian corpuscle can be isolated and its properties studied. Mechanical pressure of varying strength and frequency is applied to the corpuscle by the stylus. The electrical activity is detected by electrodes attached to the preparation. Deforming the corpuscle creates a generator potential in the sensory neuron arising within it. This is a graded response: the greater the deformation, the greater the generator potential. If the generator potential reaches threshold, a volley of action potentials (also called nerve impulses) are triggered at the first node of Ranvier of the sensory neuron. Once threshold is reached, the magnitude of the stimulus is encoded in the frequency of impulses generated in the neuron. So the more massive or rapid the deformation of a single corpuscle, the higher the frequency of nerve impulses generated in its neuron. When pressure is first applied to the corpuscle, it initiates a volley of impulses in its sensory neuron. However, with continuous pressure, the frequency of action potentials decreases quickly and soon stops. This is the phenomenon of adaptation. Adaptation occurs in most sense receptors. It is useful because it prevents the nervous system from being bombarded with information about insignificant matters like the touch and pressure of our clothing. Stimuli represent changes in the environment. If there is no change, the sense receptors soon adapt. But note that if we quickly remove the pressure from an adapted Pacinian corpuscle, a fresh volley of impulses will be generated. This is why Pacinian corpuscles respond especially well to vibrations. The speed of adaptation varies among different kinds of receptors. Receptors involved in proprioception — such as spindle fibers — adapt slowly if at all. Meissner corpuscles, like Pacinian corpuscles, adapt quickly to a sustained stimulus but are activated again when the stimulus is removed. Thus they are especially sensitive to movement across the skin. 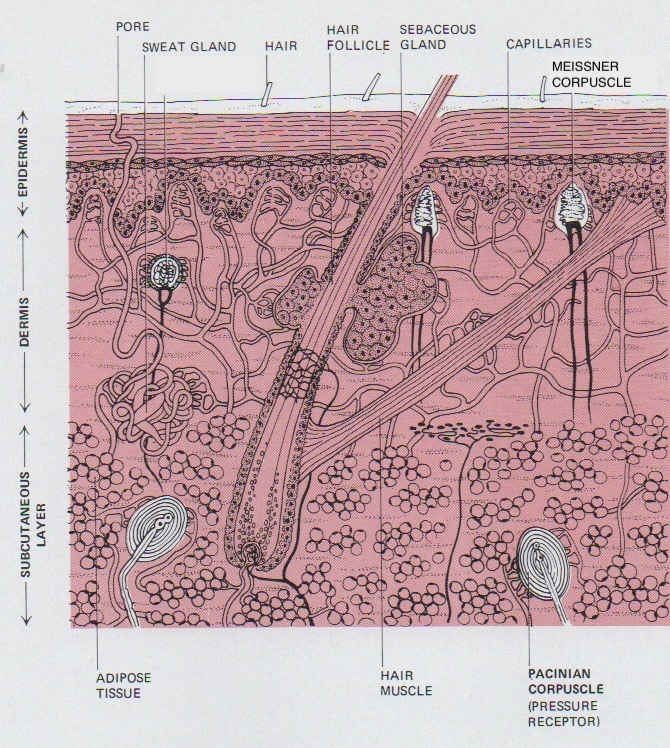 Merkel cells are transducers of light touch, responding to the texture and shape of objects indenting the skin. Unlike Pacinian and Meissner corpuscles, they do not adapt rapidly to a sustained stimulus; that is, they continue to generate nerve impulses so long as the stimulus remains. They are found in the skin often close to hairs. They form synapses with Aβ sensory neurons leading back to the CNS. The knee jerk is a stretch reflex. Your physician taps you just below the knee with a rubber-headed hammer. You respond with an involuntary kick of the lower leg. The hammer strikes a tendon that inserts an extensor muscle in the front of the thigh into the lower leg. Tapping the tendon stretches the thigh muscle. This activates stretch receptors within the muscle called muscle spindles. Stretching a spindle fiber initiates a volley of impulses in the sensory neuron (called an "I-a" neuron) attached to it. Some of the branches of the I-a axons synapse directly with alpha motor neurons (1). These carry impulses back to the same muscle causing it to contract. The leg straightens. Some of the branches of the I-a axons synapse with inhibitory interneurons in the spinal cord (2). These, in turn, synapse with motor neurons leading back to the antagonistic muscle, a flexor in the back of the thigh. By inhibiting the flexor, these interneurons aid contraction of the extensor. Still other branches of the I-a axons synapse with interneurons leading to brain centers, e.g., the cerebellum, that coordinate body movements (3).